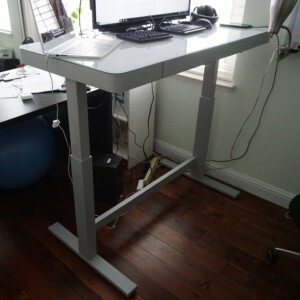 I finally picked up my Tresanti sit and stand desk my in-laws found in stock at Costco when it was on sale for $200 (normally $300). It was sold out and nearly all the Costco's in San Francisco Bay Area, but we nabbed the last one at a Southern California Costco. Ever since seeing them around work, I have been looking and waiting for a sit and stand desk deal forever. I never cared much for the table top variations, mostly because of the drawbacks of limited space. When in standing mode, the rest of the stuff on the table is not readily accessible. Based on the display at Costco, this desk looks nice with the glass top. To change the height, use the touch sensitive buttons on the glass. It therefore has a very clean look without bulging electronics out of the side. It also has 3 USB chargers, but not something I am likely to use. There's also a physical switch that locks the current height. The moment I saw it and demoed it at Costco, I knew for $200 I had to get one. The desk itself in-box is heavy. And that's because the legs are solid and the table top is glass. Be prepare to lift the box with a couple of people and set it down gently. There is a drawer in the front that has a nice felt bottom and a couple of preset metal dividers that are not adjustable. However, this also means that there is no keyboard tray. However, it does come with electronic controlled up and down so that you can adjust the desk to the perfect level for your elbows to be at 90 degrees for ergonomics to improve any shoulder or arm pains. It comes with a 4 memory slots and they're very easy to do. Just long press the memory number until it beeps. Very similar to how presets are set on a car's AM/FM radio. And for power outs, this sit and stand desk can remember the presets, though I'm not sure for how long. Whenever you press any of the buttons, the table beeps. This beep can be disabled by pressing and holding the "lock" buttons next to the USB ports. The Tresanti sit and stand desk minimum height is 29 inches and the maximum height is 46.5 inches. The controls are touch control built into the glass on the right side, so its possible to accidentally bump it. Any dust or dirt easily show up on glass, although I haven't noticed any fingerprints yet. You need to be careful not to scratch the glass. There are no monitor arms for your monitors, so for those looking to align the top of the monitor to their eyes for ergonomic purposes, you'll have to find a different way to adjust your monitors. Too low, and your neck will get strained from always looking down. Too high and you will always be looking up. The table itself is very stable, even when extended to it's tallest height. I think that because the legs are made of heavy steel, it's able to maintain even the heavy glass surface of the table. But bottom of the legs have plastic protectors, but I didn't want to risk scratching the floor, so I added self adhesive felt pads to each one. The stability wasn't affected. There's also no holes in the table top for cable management, so any computer wires will just droop off the edge of the table, likely the back. Also, the USB and height lock is located on the right side of the table. If the table is wedge along a wall on the right side, the USB slots will be not be accessible. The USB is 7.2 amps total (2.4 amps each). The lock can be pressed immediately after pressing a preset and it will continue to it's memory height. Noise levels of the motor are certainly noticeable, but not something that is overly bothersome. Mostly because it only takes a couple of seconds for the desk to reach the right level. That being said, I wouldn't consider it whisper quiet. Finally, for people concerned about power usage, this does have LED illuminations that always display the current height is on, but does turn off after awhile on its own until you touch a button on the glass.